Once upon a time, in ancient Rome, a young man called Perseus had the bad luck to fall in love with the wrong woman, so wrong that she had snakes for hair instead of curls, and a face so frightening that it was capable of turning any heart into stone. But not his heart! One certain day in June, taking advantage of the euphoria of the fesival of St John, he plucked up courage to go to her although he was frightened of being turned to stone. He decided to disguise himself as a bush of basil. “Who is there” asked the Medusa, peering into the the false basil. 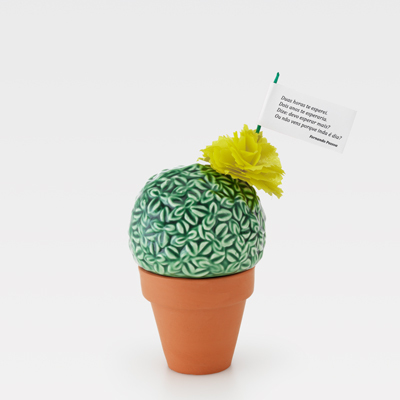 “It is I, my love” said Perseus, “I bring you a pot with the Herb of Lovers, with the verses of Fernando Pessoa because I know he is your favourite poet"!” (Herb of Lovers was the name given in Ancient Rome to basil). “Where are you?” shouted the Medusa “Show yourself, I cannot see you!” “I am here my love” cried Perseus, half afraid, with reason. But before he could finish the sentence, Bang! , the Medusa transformed the basil bush into stone just by looking — like the look that women give their menfolk when the men forget their birthdays! But the love of Perseus, so alive and so warm, broke the spell and only part of the basil was pertified. 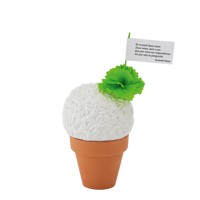 There was space inside the pot for him to breathe, and there was soil and seeds, and everything. 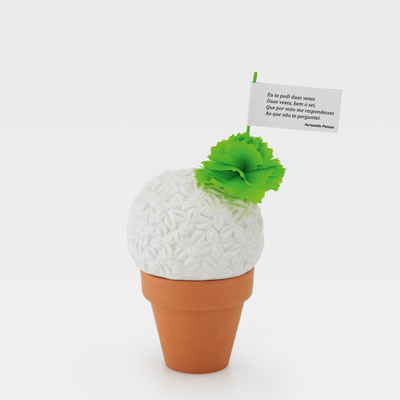 “Oh I have a wonderful idea” he thought, admiring his good luck, “I can plant the basil as a symbol of my love, and when it dies I have this stone to remind me how beautiful was the basil I planted”. Filled with courage he came out of the petrified bush and escaped stealthily, getting near enough to the Medusa to steal a kiss. Surprised, the Medusa lost her head — as lovers do — and turned into a beautiful maiden! And thus it was, and they lived happily ever after and the basil bush was turned into their wedding bouquet, a remembrance for all, that forever underneath a cape of stone can bloom a new love! Totally made by hand, the piece comprises a terracotta pot made in Portugal and a removable insert of a basil plant in glazed matt white. 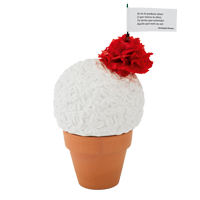 It is ornamented with a colourful paper carnation, made by hand by a Portuguese specialist in this art, and accompanied by a popular verse by the poet Fernando Pessoa. 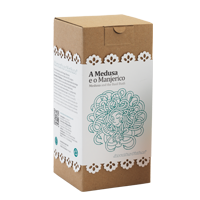 In the interior of the pot you will find a small wallet containing basil seeds to grow, supplied by one of the major national producers of this traditional plant. 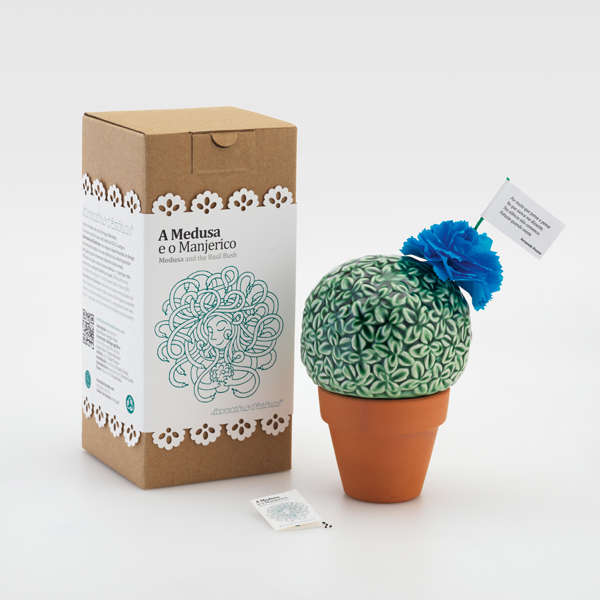 The box is made from microcellular cardboard around which is wrapped a sleeve of paper which bears an exclusive illustration and a synopsis of the tale “The Medusa and the Basil Bush”, which tells the story of a hero by the name Perseu who fell in love with Medusa, the legendary woman with snakes for hair and whose glance turns everything to stone, created especially for this piece, and written in both Portuguese and English. 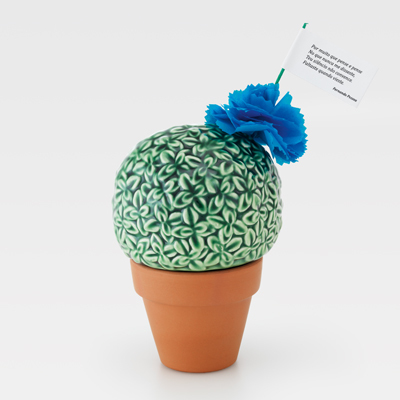 Totally made by hand, the piece comprises a terracotta pot made in Portugal and a removable insert of a basil plant in glazed green pottery typical of Caldas da Rainha. 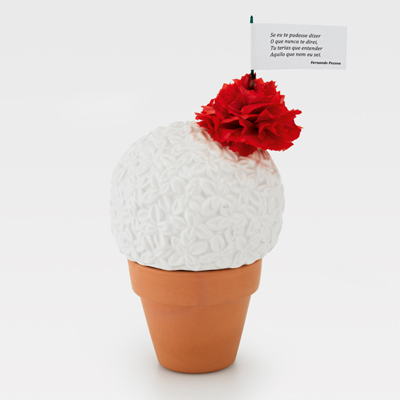 It is ornamented with a colourful paper carnation, made by hand by a Portuguese specialist in this art, and accompanied by a popular verse by the poet Fernando Pessoa. 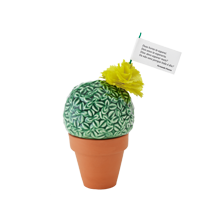 In the interior of the pot you will find a small wallet containing basil seeds to grow, supplied by one of the major national producers of this traditional plant.